The reach of the HCXC community is wide and it echoes back through the decades. An amazing amount of support has flooded in over this past week, as we have received messages of good will from over 50 friends, family members and alumni – from Grandparents in their 80s to younger siblings not yet 10. Alumni from 5 different decades reached out to us, from the 1970s, 1980s, 1990s, 2000s and 2010s. We had notes send from Washington DC, Boston, Baltimore, New Haven, and New York City on the East Coast to Atlanta, Columbia-South Carolina, Blacksburg-Virginia, and Raleigh Durham in the South, to Stevens Point-Wisconsin up North, to Denver, Los Angeles, and Claremont-California out West. In our own midwest, letters came from Davenport, Iowa, from Urbana-Champaign (several), and even from Elmhurst and La Grange! All of you who sent letters or who simply have kept us in your thoughts, you have contributed a significant gift to our team – you will be the proverbial wind to our sails when we toe the line tomorrow. We cannot thank you enough. To all the family, friends, and alums who have sent messages of support, we cannot thank you enough. It’s not too late to send a message – direct any notes to the top 7 to me (nlawrenc@hinsdale86.org) by Thursday night, and I will make sure they are included in the packet to our team. Truly, words cannot do justice to how much gratitude I feel for you all. Now, on to state! To HCXC friends and family – we need your support! As has been our tradition the past few years, we want to send our boys off with final words of advice and encouragement. Please consider composing a message addressed to the men of HCXC (if you’d like to see some examples, see last year’s messages here: https://sites.google.com/site/hctrackxc/2014-final-sendoff. Email your message to me at nlawrenc@hinsdale86.org no later than Thursday, November 5th. I will collect all the messages together and put them in a packet for our top 12 athletes to read on the bus ride down to Peoria. I firmly believe that this ritual has had an extremely positive impact the past few years, reminding the boys how much we care about them and how proud we are. And on we go to State! It was kind of epic. I showed up at KLM around 7:30 a.m. and met up with the boys’ and girls’ coaching staffs along with the building and grounds crew, our Athletic Director, and a few good-hearted volunteers to help set up for the morning’s meet. The rain started shortly after. It did not relent. Dirt turned to mud. The creek rose. Cross country runners like to romanticize extreme conditions. Some road races are marketed on this very premise, with organizers artificially creating mud pits or stacks of hay bales for runners to navigate through. I suppose some of the participants in those races have fond memories of high school meets similar to today. I am sure, as a memory, this meet will stick with me for longer than most do. Sure wasn’t easy going through it, though! But, hey, isn’t that the essence of cross country? The girls race kicked off the days’ events. I went out to scout the southwest and southeast corners, both of which featured tight turns through concentrated mud, though scattered hay was employed in a vain attempt to create better footing. Around the first and second turns, everything looked smooth. I headed back to our team area thinking to tell our team not to worry about course conditions. Little did I realize. You can see that at that point, Blake was with the leaders and our pack was tightly together but around 15th-20th place. Nathan Hill, following instructions, was a bit farther back, and managed to avoid a catastrophe by literally leapfrogging over a downed Plainfield South runner. Another part of our pre-race strategy was to regain focus if anything unexpected happened, and that strategy paid off in this instance. Hill would move up nicely throughout the race, and ended up in 27th as our 6th man. To put that in perspective, last year’s sixth man, Ethan Planson, was 44th. Today, Ethan was 15th, his second strong race in a row. Blake, despite a nasty fall early in the race, finished a strong 3rd, and will surely be among the leaders again next week. Chris Brenk looked calm and collected throughout, methodically moving up in the latter stages of the race to take 11th overall, looking surprisingly comfortable given the situation. “Irv” was fourth for us today, finishing 16th overall, while Ryan Doorhy pushed through for 20th. Sam Fathizadeh, in a rare off day, ended 48th. He was disappointed, but is too much the competitor to be down for long. The feelings after the meet were positive. We managed to stay focused for the duration of the race in terrible weather, and, consequently, our belief in ourselves was reaffirmed. Tomorrow, many of our top 12, along with myself and Coach Westphal, will be headed down to Montrose Harbor in Chicago to watch the Big Ten Conference championships. We’ll be there to root for University of Illinois and their redshirt freshman Billy Magnesen. It will be an appropriate kickoff for state-meet week. After all, it was Billy who led us to our first state championship two years ago, finishing 12th overall and proving forever after that Hinsdale Central is a team that CAN win state. * From that point on, this team has always believed. In neither of the past two years did we have an undefeated season – in fact, in both, we lost within the final month. Yet, despite those losses, a core belief remained, as the state meet results attest. Today, we were second for the fourth time this year. The coming week will be epic, too. I’ve no idea what the outcome will be. We could run great and finish 5th. We could run great and win. I do know this: no matter what happens, this year’s team has succeeded in building upon the legacy it was bequeathed. They’ve poured their hearts into this season, and it’s starting to show. They believe. **-I should also point out that Scott and Elaine Moore braved the cold to come out and cheer for the team. Their son, Doug, was the lead runner on our 2008 team which was the first team in our tenure to qualify for state. In many ways, Doug and his teammates made everything that came after possible. Thanks to Mark and Sarah Magnesen and Bruce Gartner, also, for your support – and a special thanks to all the parents who volunteered to help today, or who came to cheer the team on. 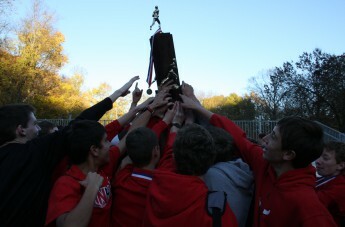 Thanks to all the current HCXC runners for your support – you, too, have made these final weeks possible. Finally, a huge debt of gratitude should be paid to Coach Kupres and Coach Snee for doing the lion’s share of the work in setting up and taking down the course today. Those two spent more time out in the rain than anyone – their contributions are beyond measure. On Saturday evening, as I sat next to my wife, Megan, on the couch, the pleasant aromas of our autumnal dinner wafting from our warm oven, a few last rays of sunlight streaming through the windows, I turned to her and said exactly that. The evenings’ contentment was undeniably made possible by the events earlier in the day (I remained unembarrassed and unabashed in confessing that my spirits are inextricably bound to the boys I coach). After a difficult conference meet, we’d responded nicely with a strong showing at Regionals, picking up our first outright victory of the season. Admittedly, we ran against an LT squad that was short-handed, opting to hold out their top 4 runners since their advancement on to Sectionals was never in doubt. We elected to rest three of our usual top 7 (Blake Evertsen, Sam Fathizadeh, and Nathan Hill), but kept in Chris Brenk, Andrew Irvine, Ethan Planson, and Ryan Doorhy to give them more practice in executing race strategy. To these four, we added Sean O’Connell, Jacob Belgrad, and John Bynan, all underclassmen who’d get some important experience in the state series races and have an opportunity to jockey for position within our top 12. The meet started auspiciously, with our girls’ team pulling off a minor upset by squeaking out a win against LT, a team that had beaten them soundly the week previous. The addition of Annie Zaher (older sister of Steven, and a state champion miler) to the lineup for the first time this season no doubt provided a lift for the Lady Devils, as they appear to be rounding in shape at exactly the right time. We hope to follow suit. Conditions at race time were appropriate for fall in the Midwest: brisk winds blowing out of the southwest, a bit of mist in the air (a few hours earlier, there’d been a torrential downpour – the unusual afternoon starting time proved to be a blessing). From the gun, runners from Hinsdale Central and Lyons Township moved to the front, along with Dan Santino of St. Ignatius and Eduardo Martinez from Morton. By the mile mark, the lead pack was down to six: Santino, LT’s Tim McCarthy, and our front four of Brenk, Irv, Ethan, and Ryan. This sextet came through in around 4:48, with O’Connell and Belgrad about 20 meters back, Bynan a bit behind them. The pack continued to hold, with Doorhy and Brenk taking turns bearing the brunt of the winds. At the 2 mile mark, we had four across in 9:51 – every single guy faster than they’d been on a wasted 3200 time trial we’d held two weeks earlier (on an equally windy day). A determined Sean O’Connell came through the 2 mile mark in 9:59, the first time he’s ever broken 10 minutes for that distance. It was evident by this point that Sean would be our 5th man, as the pain was evident in the faces of Belgrad and Bynan who were several seconds back. The question now was when the front pack would break, and who would emerge from the scrum. Santino was the first to make a move, opening his stride at about the 2.5 mile mark and catching most of our guys off guard. The one guy to respond was Ethan Planson. Though Ethan could not quite keep up with the decorated Santino (we’d seen him once before this season, at the Palatine Invite, where he finished 5th overall losing only to Jon Davis, Blake, Filip Pajak, and Matt Peirera – all among the best runners in the state, and perhaps the nation) his assertive move showed a growing confidence. Brenk took a few moments to regain his composure than began his chase, catching up and passing his teammate around the final curve, but responding too late to catch back up to Santino. Chris finished as the runner-up with Ethan taking the bronze. For Ethan, the race was a major breakthrough. He’d finished a disappointing 26th in Conference the week previous, but looked like a transformed man a short seven days later, running with the poise and confidence he’d often showed at the Sophomore level last season. The jump from 10th to 11th grade is the most difficult in Cross Country, as the level of competition increases significantly. It takes time to learn. Ethan, along with Ryan Doorhy and Sam Fathizadeh, seem to have finally made the jump. “Irv” and Doorhy were our next two across the line, with Andrew finishing a strong fourth, and Ryan 6th behind McCarthy. Andrew looked strong and relatively relaxed for much of the race. Doorhy, though, paid a price for taking the role of leader for much of the early sections of the race, but gutted out a 6th place overall finish. He clearly went to the well for his teammates, leaving his lunch on the grounds of LTs campus midway through his cooldown jog. Doorhy and Planson have charted similar trajectories throughout their HC careers, and so it would not surprise me to see Ryan have the kind of race Ethan just did in our final two weeks. With these two stepping up to join our front pack, we form a much stronger group. 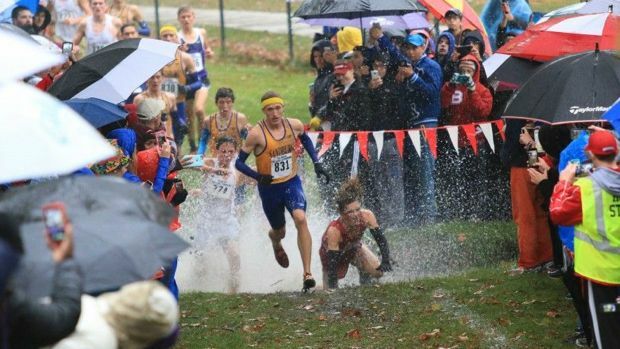 Sean O’Connell finished 10th, battling hard down the final stretch with Alex Pall of Lyons Township, who had finished 20th at the varsity level in last week’s bruising WSC championships. It was Sean’s best race of the season, and he acknowledged afterwards that he’d never gotten out so hard. He is one of the finest Sophomores in the state, and in two years one expects this will be his team to command. In the meantime, he and Steven Zaher, who comprise the sophomore contingent of our top 12, will get to experience state from the inside, after attending both sectionals and state last year as fans. On that note, we are grateful and appreciative of the many people who came to support us yesterday. Sean O’Flaherty and Matt Tobia were both back from college for the weekend, and on the sidelines rooting for their alma mater. Youngsters Brandon Belgrad and Alec Hill came to support their teammates, perhaps envisioning a future date in which they don the red and white for the state series. A large contingent of members from our ‘white’ and ‘orange’ groups were there, as was Joe Glasby, the Reids, the Andersons, and our Principal, Mark Kolkman. My apologies to anyone I missed, but know that your support means a lot. If there is one real piece of advice I can offer about how to improve as a runner that I am absolutely confident about, it is that any individual will reach deeper within when they know they are part of something bigger than themselves. You all contribute to that culture. Thank you. The story of our conference meet is a synthesis of the narratives of two of our athletes, John Bynan and Yuji Cusick, and the emotions I felt watching them both kick to the finish in the JV race: simultaneously, joy and heartbreak. Here are two of the hardest working athletes on our team, both of whom have devoted countless hours to their pursuit of self-improvement, both of whom literally have pushed themselves to the breaking point, and both of whom have had to endure extensive regiments of physical therapy and cross training in their desperate quest to be healthy enough to compete at Conference. In short, these two are emblematic of the many HCXC athletes throughout the years who have invested heavily into our program – who have contributed more to us than we could possibly repay. Bynan, as I’ve stated in previous blogs, was the only guy who never missed a single day of practice over the summer (or over the course of the season either – he literally has perfect attendance). Of all athletes on our team, only Blake has put in more miles this season. But Cross Country is an unforgiving sport, and it exacts a cost on all who have the courage to test their limits – in John’s case, the required toll was a nagging peroneal tendon, an injury that has sidelined him for periods of both his Sophomore and Junior campaigns. In the week leading up to Conference, John harbored doubts about his race readiness, acknowledging on his logarun page: “ Left leg is hurting but powering through for this race tomorrow.” Even a mile into the race, I too, feared injury would prevent John from realizing his goals, as he lagged behind our top pack, composed at that early stage of Jan Erick Naess, Ben Schnieders, Michael Gates, Zach Sayre, and Ruiling Ge. But then, something started happening. The next time I saw John pass by, he’d closed the gap in half. By the two and a half mile mark, he trailed only his companion Ben Schnieders (they’d finished seconds apart from each other in more races than I can count) who was also, clearly, having a great race, and both men were charging hard. I positioned myself at the final straightaway to get my last look at our runners as they dashed by, and when JB came into view I saw a changed man – a normally affable lad with the most determined look on his face I’d yet seen. He sprinted home for 5th with a time that would have put him in our top 7. I felt chills. That look of fierce determination could also be read on the countenances of our next pack of runners, as Schnieders, Gates, Naess, Sayre, and Ge finished in a clump, capturing places 9-13 and setting history in the process by giving us 6 all-conference runners in the open race, our most ever at that level, and 15 overall on the day, also a team record, eclipsing the mark of 13 set by both the 2013 and 2014 state championship teams. Next came Yuji, fighting to the end. He raced as he trains – with courage, persistence, and pride – but in the end (for this season, as well as his junior year) he fell achingly short of his goal. Yuji and I had talked the day before his race about his hopes and his strategy, and I encouraged him to take a risk at the meet – to race with boldness and aggression. “What is the worst thing that could happen?” I asked, thinking I’d help him get perspective with a reminder that a subpar race is not a big deal in the grand scheme of things – but his answer brought me up short: “that I won’t make the top 12. That I peaked sophomore year.” Though I assured Yuji that his best races remained far in front of him should he choose to continue running beyond high school, there was not much I could say to provide comfort should he not make the top 12. Though it seems like an arbitrary goal and not a completely fair one to hold one’s self to (as you can’t control how other people race, only yourself), in Yuji’s case, I understood what he meant completely. He’d been in that top 12 as a Sophomore, and got to be up on stage with our first state championship team. I am sure that as he helped his teammates hoist the trophy, he imagined himself returning to the stage as a member of the top 7, knowing he had two full years of high school left – plenty of time to improve and develop. That is how it is supposed to work. And in his last two years of high school, Yuji did work harder than he ever had before. Yet the outcome was the worst possible: a severe stress fracture during his junior year which he still has not fully recovered from. Perhaps no athlete I ever coached has sustained a worse injury. Very few have shown the determination and patient grace required for the hundreds of hours of rehab he undertook in order to be able to return to the sport he loves. After a miserable junior season spent on crutches, Yuji hoped for redemption as a senior, setting a goal to make the top 7 and doing what was necessary every single day (in his training, in his diet, in his sleep patterns, in his care for his body) in his attempt to achieve it. Through it all, he retained a positive disposition, was the senior leader we needed him to be, and kept a good balance between sport, school, family, friends, and rest. So, when I saw Yuji at the halfway point of the JV race, desperately trying to cling to his teammates but wincing in pain, my heart sunk. Moments after the surge of adrenaline came from watching JB and Ben finish, I felt pangs of sadness as I came to the realization that Yuji’s dreams for his senior season would not, in the end, be realized. I felt similarly for Emmett Grundberg, another team member plagued by injury who’d emerged in the early parts of the season as a legitimate top 7 candidate after an excellent race in Peoria. For Emmett, I could at least take solace in knowing he was a junior, and would have another season to prove himself. For Yuji, we’d have to accept reality. He may yet experience the joys of seeing his work pay off, but it will not be as a member of the HC Cross Country team. I am completely unashamed to acknowledge that I shed tears with him after the race. He’d given his all for us and didn’t get the reward he deserved. In this sport, we preach two somewhat contradictory mantras: hard work pays off, and hard work is its own reward. To be completely truthful, the first statement is not always accurate, at least if one is looking for a neat equation where hours and effort put in equates assuredly to your hoped for result on race day. A coach can always cherry pick cases which perpetuate the myth. We had in attendance at Conference two of our programs’ best recent examples in Josh Feldman and Griffin Gartner, teammates on the 2014 state championship team, and two guys who are living proof that sometimes dreams do come true for those who set out to achieve them. Chris Kennedy was also at the meet. Chris was our first EVER member of the 1000 mile club. He ran 70 mile weeks, but never once a varsity invitational. Chris helped build the foundation that would lead later teams to the top of the mountain, but when we hoisted our first state champion trophy in 2013, Chris was not on stage, but rather looking up from audience, having driven up from Champaign where he was a freshman to cheer his former teammates on. Chris’s efforts were never rewarded with medals or trophies, headlines or the enhanced status that comes with finishing at the front. Yet Chris perfectly illustrates the second maxim: hard work is its own reward. Chris still runs – he is a member of the club team at Illinois, along with Josh as well as two other former HCXC standouts, Nick Tandle and Ryan Somerfield. He is in charge of the Club team’s twitter account and blog (a man after my own heart), is on the sidelines for football and basketball games as a reporter, has travelled to Peru, and maintains excellent grades. In short, he is doing great. I genuinely hope all the athletes I coach will be as happy, accomplished, and supportive as Chris is when they leave us for college. All of which is to say that Yuji will be OK, though Saturday was a really tough day for him. But I think about what my old coach, Mr. Newton, was fond of saying: “It’s nice to be great, but it’s greater to be nice.” Yuji is nice. JB is nice. Emmett Grundberg is nice. Chris Kennedy is nice. As we grow up, we’ll all slowly lose the athletic abilities we once enjoyed. The medals and trophies we won in high school and college will collect dust, and it will be our character that remains. Honest to goodness, JB and Yuji are men of outstanding character. To their parents: thank you. You should be proud of the young men you raised. I can say this about so many of our athletes, though space and time prevents me from doing it here. So let those two stand in for the rest: though I hope and will work my hardest to try to ensure that everyone gets a JB-like outcome (or, an outcome like the 2013 and 2014 teams enjoyed), I will never tire of coaching so long as I get to work with people who are contributors to our team culture the way Yuji and JB have been. As you can see, the results were not the ones we were hoping for. Admittedly, we were down a man, holding back Nathan Hill who has been managing IT-band pain. That was a hard decision, as we knew we’d need him to have our best chance for contending for the win, but discretion proved the better part of valor and so we decided not to test him before he is ready so that he’ll be there in two and three weeks when we need him most. It is not unreasonable to think that his presence in the race could have altered the outcome considerably – perhaps he’d have run 15 seconds faster than our #5 man Ryan Doorhy (who ran 15:00) in which case there would have been 4 teams whose total time for their top 5 runners all came within 3 seconds. In such a scenario, we’d have finished 2nd rather than 4th, though I’m not sure we’d have felt much better with such an outcome. In truth, our varsity ran timidly, failing to execute our race plan by letting others dictate the race’s pace. Blake took the pace out hard, as expected, and was the only athlete in the race to challenge front-runner Irwin Loud, though he was bested by his conference rival this time around. After that, there was a lead chase back and a secondary chase pack, and all our athletes save Andrew Irvine opted for the comfort of the latter. 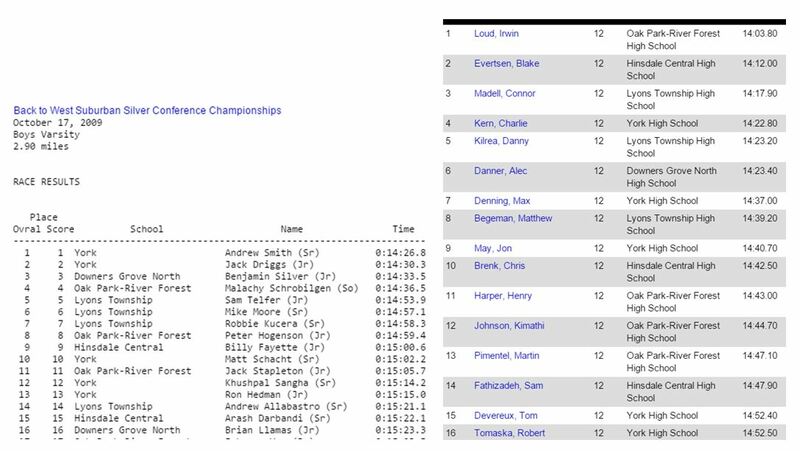 Sam Fathizadeh moved up methodically from the second chase pack and ran a gutsy race to finish 14th and all-conference, a truly remarkable feat when considering he was 33rd in Sophomore conference on year ago. Chris Brenk kicked hard for 10th, but by his own admission ran too tentatively early on. Irvine deserves credit for getting out hard, but it took all his reserves to hold on for the tough luck spot of 17th, one place out of the medals. Planson and Belgrad, who were 2nd and 3rd at sophomore conference a year ago, ran flat – each will strive to redeem themselves next week at Regionals. With such intense competition, we knew we could not afford to run safely or be off our game, and we were both. It was a tough pill to swallow finishing fourth in our conference of seven teams after having finished no worse than second in any meet over the past three seasons, but such was the case on Saturday. We can take small solace in knowing that 4th in the WSC wins almost every other conference in state, in recognizing how fast fortunes can change in this sport (JB and Sam ran terribly in a time trial on Monday before running great 5 days later; we looked awful at Sectionals last year before running our best race of the season one week later), and in celebrating what the day meant for the team as a whole rather than focusing solely on the varsity level. Just how tough has the WSC-silver become? 16th place in 2015 would have finished 5th in 2009 on the same course and in similar conditions! Indeed, our freshmen give us ample reason to be optimistic about the future. Our goal for the race was to place 5 runners in the top 25 and 10 in the top 50. We achieved that goal exactly, with Charlie Carter as our surprise 5th man in 24th and Josh Terry kicking down two runners in the final straightaway to earn 48th place as our 10th runner. For only the second time in the past ten years, we had three freshman runners earn all-conference honors (Matt Kusak in 10th, Kevin Hopkins in 11th, and Fletcher Spillers in 16th). The only other group to match that feat was our current seniors – Andrew Irvine was 5th three years ago, Michael Gates was 7th, and Tyshaun Hamilton, who moved to New York after his freshman year, was 15th. Given that we were without our #1 man Alec Hill all season and that the fastest any of these guys ran in our August time trial was over 13 minutes for 3200, this group has a lot to be proud of. The same can be said of our Sophomores. We knew from the beginning of the season that we’d have four experienced runners to pave the way for us in Sean O’Connell, Steven Zaher, Colin Yandel, and Neil Cumberland. The question was whether we could find a fifth. On Saturday, newcomer Sam Schiavitti proved himself worthy of that honor. Sam raced with the maturity of a much more-experienced runner and executed the race of his life to finish 20th overall for us. Pretty incredible for a guy who started the year with a 3200 PR of 13:16. O’Connell led the charge with a third place overall finish, running his best race of the season to date. He was followed through by teammates Zaher (in 10th) and Yandel (in 13th). All three men improved upon their finishes from last year, all earning all-conference for the very first time. Cumberland, who earned all-conference as a freshman, faced an uphill battle this season, fighting back from a stress reaction which sidelined him for two months. Though his race did not go as well as he hoped, he helped us get 5 guys in the top 25 to secure us third place overall, a mere 3 points out of second. These five, along with others like Mac Anderson, Alex Choi, Kyle Jones Shaw, Kiril Kuzmanvoski and our freshman core, give us plenty to work with in the coming years. So, we enter now the championship phase, and no one could plausibly claim that we haven’t been battle-tested. Our primary season goal, of being the best HC team ever, remains possible, though it will require focus, determination, and most of all, belief. Yet even if we exhibit all three qualities, no outcome is guaranteed, as the conference meet reminded us. But, as the deeply felt emotion of the weekend (both joyful and painful) also reminds us: no matter what happens, it will have been worth it to try. This past summer, my family and I made the journey north to the “U.P.” or the Upper Peninsula of Michigan, where we stay in a log cabin that my grandpa built. The U.P. has the largest percentage of people with Finnish ancestry in the entire country, and it is common to see Finnish flags hanging on porches when driving through towns. Although my grandpa didn’t have any Finnish blood in him, both my grandma and his friends did, so he conformed to the culture of the Upper Peninsula by naming the cabin “Rauha Maja” which, translated into English, means “peaceful cabin.” Additionally, despite an absence of plumbing and electricity, he felt compelled to build a Sauna right behind the single-room cabin, a necessity for any true Finn. At Rauha Maja, before a day of preparing food on the campfire, doing yard work, and throwing rocks into Lake Superior, I kept my summer training up by running on the peaceful roads that lead to the cabin. The dirt path was lined with seemingly endless trees, similar to the trails at Waterfall Glen. Like any run, it was difficult just to focus on the workout itself, and with the tranquil setting and lack of cars contributing to the monotonous serenity, my mind wandered to other things. My thoughts revolved around an idea that was familiar to the cultural background of the region. This idea, wrapped up in a single word, is of Finnish origin, and helped me get through my 12 mile long runs and tempo miles. It is called Sisu. This isn’t just a word that comes from Finland­– their country lives, breathes, and exists because of Sisu. In World War II, the Finnish army defended their country against the Soviet Union in a three-month-long battle called the Winter War. The Soviets outnumbered the Finns 3-to-1 and possessed 6,000 armored tanks, overpowering the mere 32 Finnish tanks. However, using guerilla raids on the Soviet line at night, the Finns managed to repel the invasion by the end of the winter. In fact, the Soviets suffered more than four times the losses than Finland did. The Finnish army fought through -40º Fahrenheit temperatures in 18-hours of darkness a day, and attributed their victory to Sisu. Personally, I’ve always struggled with finishing hard during races and workouts. When I was a freshman, I heard a motivational piece of advice for 3 mile cross country races: “The first mile is adrenaline. The second mile is training. The third mile is guts.” Even though I’ve learned through experience that this isn’t entirely accurate, I believe that in the end, the race will be decided by guts. Finding that drive has been my biggest area of improvement, and I’m sure that there are others on the team in the same situation. So, as we are all ending our seasons, I implore all of my teammates to run their final races with guts. I entreat everyone to be willing to endure more pain than the guy next to them, because that guy is in pain too. I challenge you to “Finnish” the race with Sisu.